The Paper Landscaper: Aww thanks! As soon as I saw this image, I had to have it! It's one of the Lilli Claire images from Tiddly Inks and it's called "Aww Thanks." She was fun to color! The layout is the March Sketch For You To Try, the sentiment was made on the computer with the Pristina font and it's up on foam tape, Stickles were added to the bouquet of flowers, and I added some machine stitching. I'm tired just reading about all you have done so fare LOL! Darling card and fabulously coloured. Love the touch of twine. I'd like to tap into the same energy source you're using my friend! You're a dynamo!! Beautiful coloring and shading on this sweet card, and I love the stitching! I'll be there with bells on for breakfast - and SO looking forward to it!!! See ya in the am! 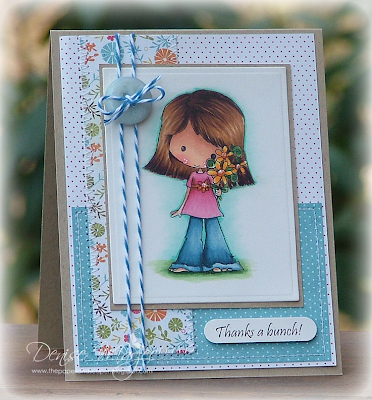 Such a pretty creation...your colouring is always so beautifully done...and the twine and button are just so cute! A gorgeous little card. Your colouring is fabulous Denise! Simply adorable Denise. I love your papers you used and coloring is perfect as usual. Great card. Oh Denise...your the best! I so love this card. Adorably coloured!!!! You will have to show us pictures of that new furniture. I want to order new stuff for our newly renovated family room but I am stumped. I know you will have great taste, so it is going to be worth the wait!!! Busy, busy, busy!! Such a pretty card, too! You always use the prettiest patterned paper. I LOVE that floral! aww such an adorable card Denise... i love the image! This is, by far, one of the prettiest cards I've ever seen! Just lovely in all the blue and your coloring and shading on this image is so perfect! Love everything about it. Girl, this is so freakin' cute! Love her! You've coloured her beautifully!!! Glad you had a productive day!! Enjoy your breakfast out! To accomplish all that and still have time to produce an adorable card on top of it, I'm impressed!!! Your coloring of her hair is amazing, she is adorable! 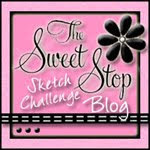 Your cards are just wonderful and your coloring is amazing! OMgosh...she is so cute, and perfectly colored too!! Love this, Denise!! You go girl!! You are crossing things off your list fast!! All that and you made this card too! Fantastic! Love this! Beautifully colored and put together. So adorable, your coloring is fabulous.